BAJHANG, SEPT 17: As many as 18 VDCs adjoining Chainpur, the district headquarters, are suffering from scarcity of food items while the local office of the Nepal Food Corporation (NFC) is letting the stock of rice in its godown rot. Dungri, Ghogada, Nauli, Sekri, Ana, Doli Chaur, Jada, Saingaun, Bhelat, Surma and other VDCs have been facing scarcity of food items due to difficulty in supply since the last four months attributed to road obstruction. Many locals have been facing problem obtaining food items, including rice, said Khadak Bohora, a local of Dolichaur VDC. The shops in the majority of villages are out of stock, Dhanalal Bohora of Bhelat village said. Food production in the district has gone down with villagers choosing other types of work or preferring yarshagumba collection. 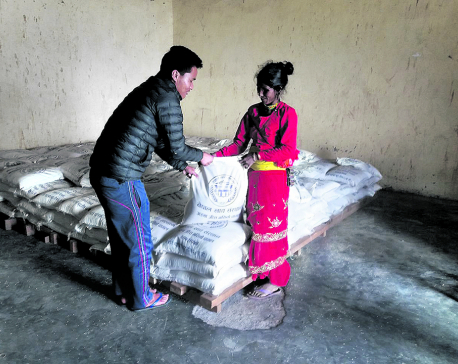 At a time when villagers are reeling under shortage of food items, 3,000 tons of rice is rotting at the godown of Nepal Food Corporation (NFC). The NFC has no plans to distribute food in its store, according to locals. “We will start distributing rice if the government instructs us to do so,” Ishwari Datta Pandey, NFC district chief, said.